Pocket AnyPassword 1.0RC1 is password managers software developed by RomanLab Co. Ltd..
Entrust your passwords to Pocket AnyPassword. Now your passwords can be kept secure in your pocket PC. The utility organizes all data as a system of folders and subfolders, where you can get what you need within seconds - an advanced search option is at your service. All passwords are protected by the RC2/MD5 encryption algorithms. Added to this is a multi-user support, a password generator and synchronization with a desktop PC. This security & privacy program is freeware, so you can download and use it absolutely free. 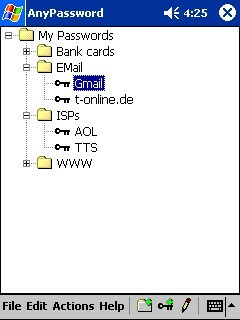 Pocket AnyPassword 1.0RC1 supports English interface languages and works with Windows Vista. Latest Pocket AnyPassword 1.0RC1 does not contain any spyware and/or advertise modules, allowing installing it with no worries concerning valuable information loss. Our website has thoroughly tested security & privacy product Pocket AnyPassword 1.0RC1, written the review and uploaded installation file (96K) to our fast server. Downloading Pocket AnyPassword 1.0RC1 will take several seconds if you use fast ADSL connection.